One of my most popular FREEBIES is my Compound Word Packet. It is part of my Super Star Skills Series. I taught 2nd grade for many years and worked with a wonderful group of teachers. They allowed me to take something we came up with called Super Star Skills and share them with you. The first year we did Super Star Skills as a couple of months of test prep. We looked at our state test release questions and our data and made the decision to focus on a skill a week until testing. We gave the kids pretest, focused on the skill and then gave post tests. The kids knew their goal was to pass the post test and we incorporated a lot of motivation. We found it very successful. Over the following years, we used the Super Star Skills over the course of the year to focus on key skills for about two weeks at a time. Recently, I was contacted and asked if I would make more. I love the idea that people are using them. I know it made a difference for my students to have that focus. How could I say no? So, this weekend I borrowed back my two gigantic binders that I left with the current second grade teachers. I went through the tests and made sure I now have them all on my computer so I can keep making the skills. The packet contains a pretest, postest, two games, two posters, answer keys, and motivational rewards and tools. 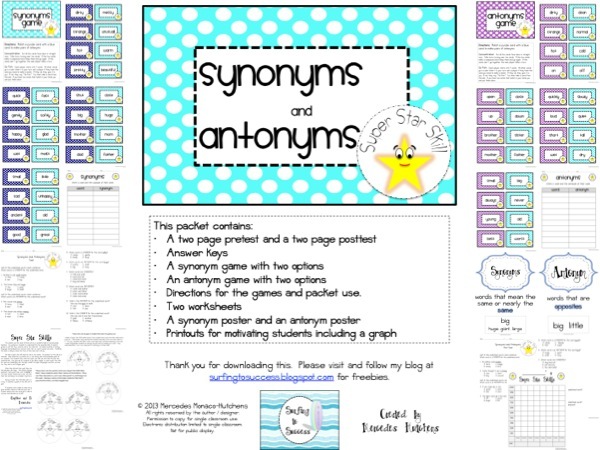 You can find the Synonym and Antonyms: Assessments, Games and Worksheets packet here. If you haven’t picked up my Compound Words FREEBIE yet, please do.